The physical approach to the wineries we visit usually gives us a clue to the nature of our impending experience. It’s like opening a book, reading the first page and forming an opinion as to whether this is a story we will enjoy. 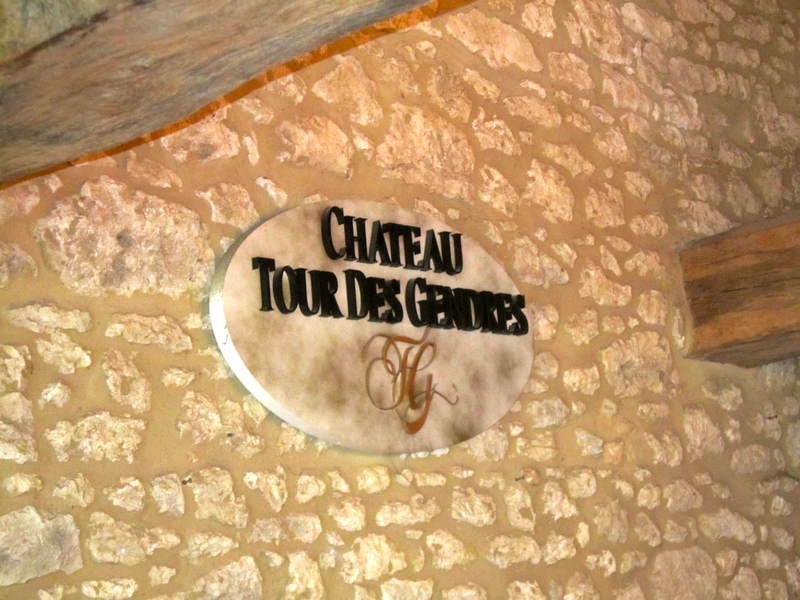 We had no doubts we would enjoy our visit as we approached Chateau Tour des Gendres. The route gives us the first clue: the road there is off the beaten track, an upside-down sign points the way through the treed and hedgerow lanes and a narrow driveway between farm buildings beckons us as though through an archway to the winery which opens up before us. As we drive into the winery courtyard through this narrow entrance we feel a great sense of calm and tranquility in this magic circle of house, chai, tasting room and offices, tucked away in the countryside. If a unicorn had suddenly appeared it would not have come as a surprise! Chateau Tour des Gendres is owned by the de Conti family, two brothers, a cousin and their wives, and has been in operation at three different family properties from 1981. Yet wine has been made on this land for at least 800 years. Luc de Conti, the wine maker and a co-proprietor, greeted us warmly and immediately invited us to walk among the vines. As he says, the vines are the heart of their operation. Monsieur de Conti is articulate and passionate about his vines and generous in the time he spent with us. Influential in the Bergerac wine region, he is a past President of the Syndicat des Vins in Bergerac. As we stood among the neat rows of vines, Luc explained the Chateau Tour des Gendres farming and winemaking ethos which is to work in harmony with nature. Tour des Gendres is an organic winery operation and was certified “Bio” by AGROCERT (Agricultural Products Certification) in 2005. The decision to pursue the organic route to wine making is health related and started in 1994. Luc explained they do not use any chemicals in the vineyard. They use very small amounts of the substances, such as sulphites, which are allowed under the organic wine making regulations. Luc and his team prefer to use emulsions in the vineyard made from plants such as nettles, horsetail and heather. Luc described how birds from the neighbouring oak forests are also part of their arsenal against certain insects in the vineyard. He showed us how the vines are pruned to limit the number of buds and hence manage the yield per vine to support the high quality of their wines. After time among the vines, Luc invited us to the tasting room to sample the Tour des Gendres Appellation D’Origine Controlée (AOC) Bergerac wines. We tasted 7 wines in total: 4 white wines and 3 reds. The wines are blended from their own grapes in accordance with the AOC guidelines. Luc also makes a couple of single varietal wines: a cabernet sauvignon and a muscadelle. Since these two wines do not conform to the AOC guidelines, he bottles these in the distinctive sloping shoulder Burgundy style bottles to differentiate them from the AOC Bergerac wines. 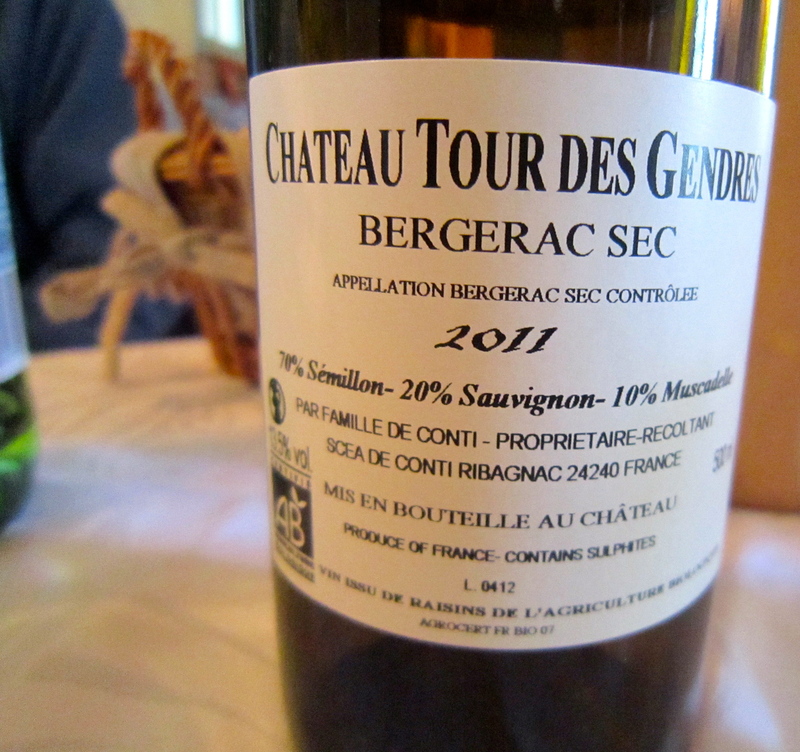 Always interested in the marketing of wines, we asked about the market for the Tour des Gendres wines. As we have heard in other wineries, Holland and Belgium are key markets. Interestingly, Québec represents a significant overseas market for their wines and three of them are listed on the Société Alcohol Québec (SAQ) website: Cuvée des Conti (white), Gloire de Mon Père (red) and Moulin des Dames (white). The Cuvée des Conti white wine is particularly popular in Québec where the predominantly Semillon blend of this wine (Semillon 70%, Sauvignon Blanc(20%, Muscadelle 10%) is favoured to accompany food. The main white wine grape varieties grown in SW France are Semillon, Sauvignon Blanc and Muscadelle. 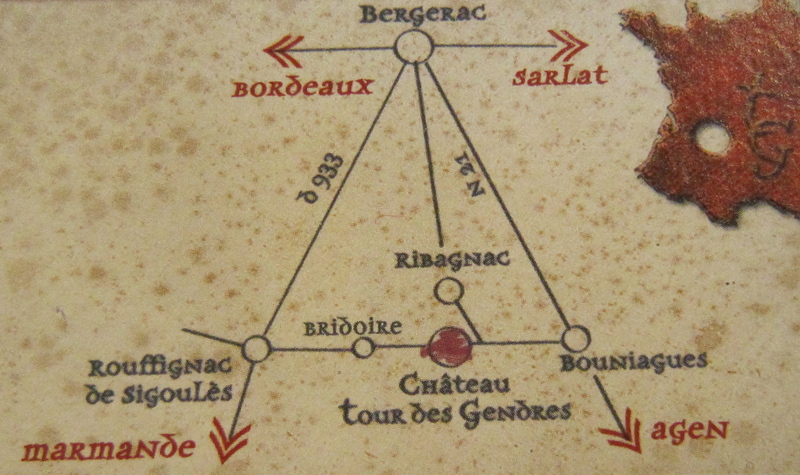 These are the significant varieties permitted in AOC Bergerac Sec wines and the AOC wines must be blended from at least two of the permitted grape varieties. What creates the subtleties and differences in the wines are the varying percentages of grape varieties used by wine makers. 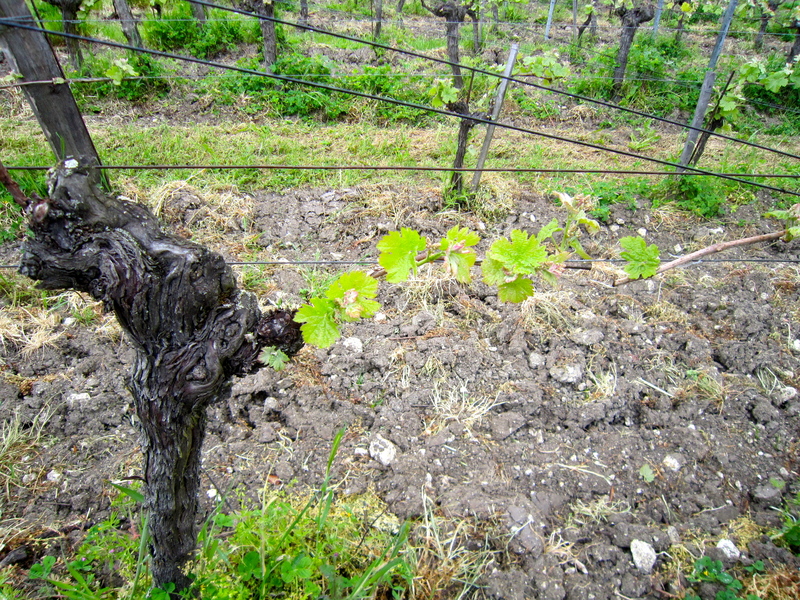 These might further vary year by year depending upon weather, geology, harvest conditions and other ‘terroir’ elements. 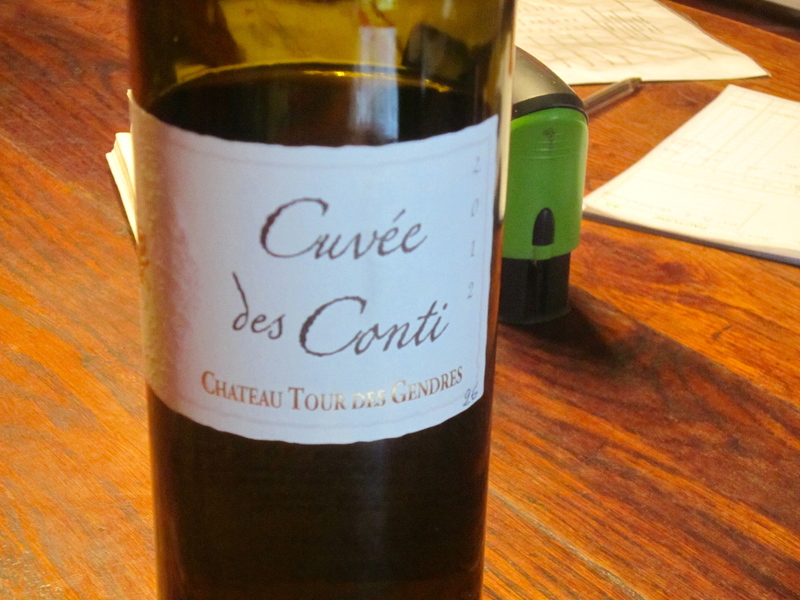 In this tasting, we particularly paid attention to the discernable difference that a shift in varietal percentages in this classic Bergerac white wine can make. A Sauvigon Blanc focus may provide more of a sipping wine or a Vin de Plaisir. Whereas the Semillon focus of the Cuvée des Conti gives the wine a combination of a honeyed texture and complex flavours and this is what supports its suitability to accompany food as opposed to being a sipping wine. 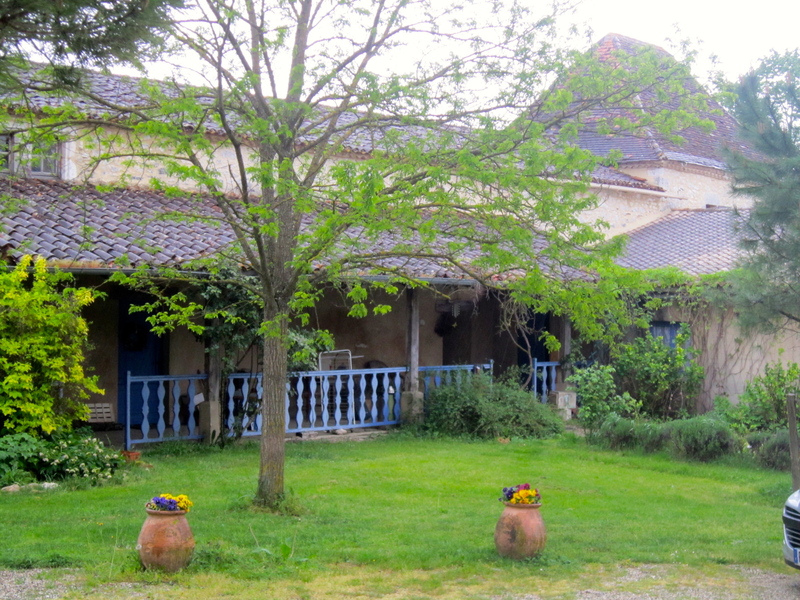 We experienced an illustrative food pairing first hand a few days later when we had lunch at the Restaurant Chez Alain in the historic market village of Issigeac following a visit to Issigeac’s popular Sunday morning market. The Cuvée des Conti is on the Restaurant Chez Alain wine list. We selected it to accompany a chicken dish and were immediate converts to this Semillon style of Bergerac white wine with food. Not only is Luc de Conti a good teacher about wines and wine making, he is also whole-heartedly committed to natural wine making methods. The excellent range of Tour des Gendres wines live up to the family’s vision of wine making on three distinct geological properties in a style that exemplifies fruit, balance, strength and freshness. The press reviews and awards consistently recognize the quality of the de Conti wines and Luc de Conti’s wine making skills which were acknowledged by his nomination as Wine Maker of the Year in the region in 2012. As our visit to Chateau Tour des Gendres drew to a close, we thanked Luc de Conti for his time and kindness in explaining so much to us and promised to return. We drove away reflecting upon the new insights about winemaking gained from our experience in this tranquil place. 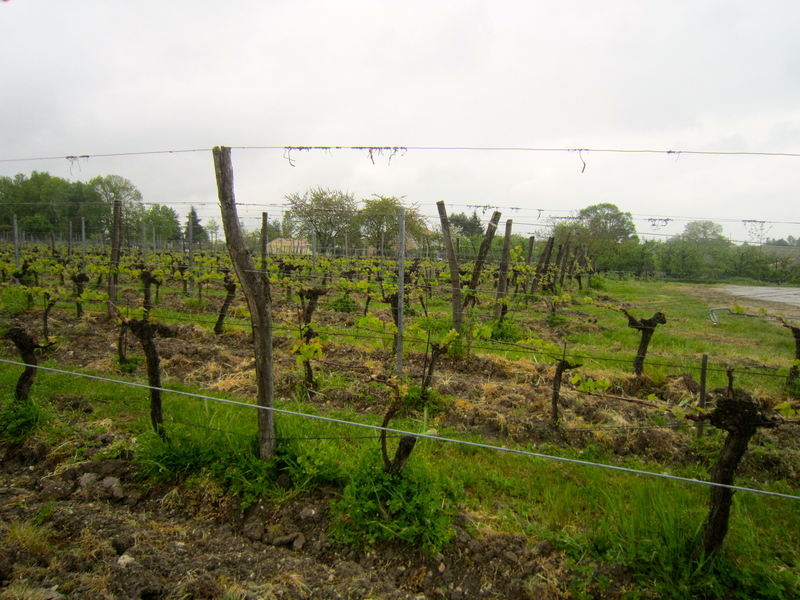 This entry was posted in French Wines, Uncategorized, wine and food, wine tasting and tagged AGROCERT, Bergerac wine region, Chateau Tour des Gendres, Dordogne, Dordogne tourism, French Wines, Restaurant Chez Alain - Issigeac, South West France, wine and food pairing, wine tasting notes by elizabethsvines. Bookmark the permalink. Très beau texte en effet, littéraire et technique, traduisant bien le projet mis en oeuvre par la famille De Conti ,révélant la pertinence des choix ,et finalement l’excellence des résultats.Il est probable que les contraintes du millésime 2013 constituent un défi supplémentaire, qui sera relevé avec élégance et une approche personnelle .Intéressante et stimulante expérience pour toute la profession. “Gloire” à ceux qui ont planté, à ceux qui cultivent , récoltent et vinifient, et à ceux (celle, en l’occurence),qui partagent le plaisir de leurs dégustations !